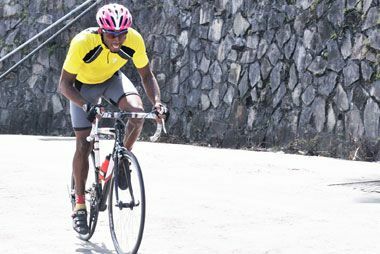 This race is in preparation the upcoming Caribbean Cycling Championship scheduled for Jamaica on the weekend of September 17 and 18, in which over 80 of the regionâs top cyclists will fight for the three top podium places. Cyclists will ride off from 1 pm sharp from outside First Caribbean International Bank in capital Kingstown, to Torouma on the Windward side of the island. From there they will journey back to the petrol station in Georgetown, then back to Tourouma three times. Thereafter, the cyclists head to the finish line at Sion Hill, in suburban Kingstown. Sundayâs race will see the participation of two of this countryâs overseas cyclists, in Tortola based Orano Andrews, and US based Dominic Ollivierre. Meanwhile, last weekend, the SVG Cycling Union hosted the second Rupert âPuttyâ Minors Memorial Hill Climb Classic from De Freitas Motors in Arnos Vale to Belmont. After the four mile event, it was Cammie Adams who came out on top in a time of 17 minutes 07.81 seconds, ahead of Shimano Bailey in second spot in 17 minutes 34.07 seconds. Filling the third position was Albert Quammie in 18 minutes 12.93 seconds. Adams also claimed the first spot in the Division Two of the race. Placing second was Zefal Bailey in 19 minutes 50.62 seconds, and third was Mathson Browne in 25 minutes 20.08 seconds. The race was in memory of former cyclist Minors who passed away two years ago.